﻿ Red Girls « Haikasoru: Space Opera. Dark Fantasy. Hard Science. It’s the RED GIRLS giveaway contest! Kazuki Sakuraba was born in 1971. She began publishing while still in college. Her early Gosick light novels were best sellers and translated into English, and her adult fiction is also popular and critically acclaimed. 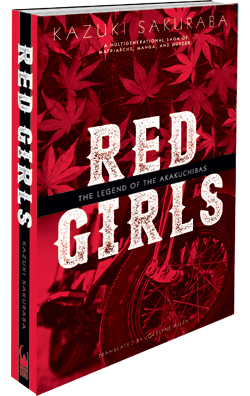 Red Girls won the Mystery Writers of Japan Award in 2007, and Watashi no otoko, a suspense novel about an incestuous relationship, won the Naoki Prize for popular fiction in 2008. Manyo looked out of place in the village and when she went into town, but the young couple took care of this strange child, occasionally severe, occasionally affectionate with her. They also sent her to school, but for some reason, Manyo could not manage to learn her letters. “I can’t read,” “I can’t write,” she would say; her studies were of no use. She would instead make strange predictions every now and then. At that time, the Third Jurisdiction Corps of the National Police Reserve (later known as the National Safety Forces), which was cre­ated by MacArthur after the war, was stationed in Izumo in Shimane Prefecture, and each member carried a carbine thanks to a loan from the US military. The corps was basically made up of young people of that generation, born in the area and also coming in from other regions, who had missed out on deployment to the front. The carbine, a mysterious weapon from which fire erupted, naturally terrified the villagers. Even now, the provincial culture of the Edo period lives on in the village. When someone commits a crime, the people rally at the village headman’s house, use spears and nets to catch the criminal, and then turn the offender over to the authorities.